— A blocked tear duct is a condition that causes the eyes to tear much more than usual. The tear duct is how tears drain from the eye. It is a path of small tubes that runs from the inner eyelid to the inside of the nose (figure 1). If the tear duct is blocked, tears can’t drain normally. This causes symptoms. 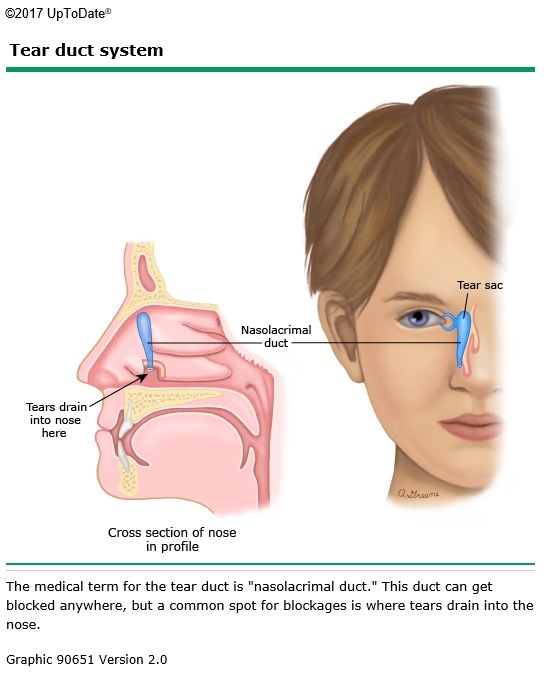 A blocked tear duct is a common condition in babies. Babies who have a blocked tear duct are usually born with it. Older children and adults can also get a blocked tear duct. 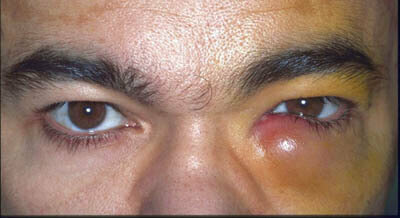 The cause of the blockage is usually an eye infection or injury. ●Increased tearing – This can happen some or all of the time. ●A blue-colored area of swelling between the eye and nose – This only happens if both ends of the tear duct are blocked. Sometimes, a blocked tear duct gets infected. An infection happens when germs grow in the tears that are stuck in the tear duct. Will my child need tests? — Probably not. The doctor should be able to tell if your child has a blocked tear duct by learning about his or her symptoms and doing an exam. The doctor might do a test to check how well the tear duct is working. — Treatment depends on the person’s age, the cause of the blockage, and if there is an infection. Doctors treat infected tear ducts with antibiotics. Some antibiotics go in the eye. Others come in pills or liquids that you swallow. Most babies do not need treatment unless their tear duct is infected. That’s because most blocked tear ducts open up on their own by the time a baby is 6 months old. To help your baby’s tear duct open up, your doctor might recommend that you gently massage it. He or she will show you how to do this. If the tear duct doesn’t open up on its own, your baby might need to see an eye specialist (called an ophthalmologist). This doctor can do a procedure to open up the tear duct. During the procedure, he or she will put a thin tool into the tear duct and push open the blockage. If the tear duct stays blocked, or the blockage comes back, your doctor will talk with you about other possible treatments. These include procedures to widen the tear duct. This topic retrieved from UpToDate on: Jun 14, 2017.